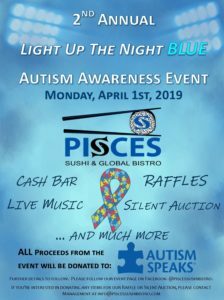 Cash Bar, Raffles, Live Music, Silent Auction and more…..
ALL proceeds from the event will be donated towards Autism Speaks. Follow our event page on Facebook for further details. Currently accepting donations for our Raffle & Silent Auction. Tickets are $25 in advance and can be purchased at the restaurant– $30 at the door. Please contact Management at info@piscessushibistro.com or 727-216-6764 with donations.